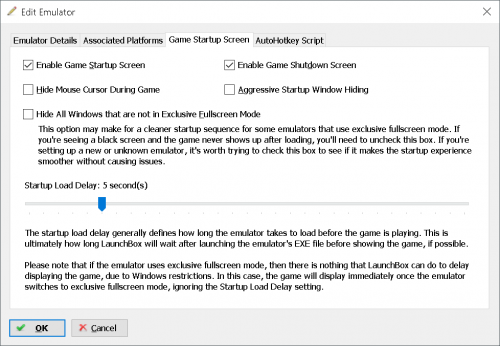 game start up breaks emulator after i turn off rocketlauncher fade screen. when i turn on rocketlauncher fade screen and turn off launchbox startup screen everything is ok. The Launchbox startup isn't breaking the emulator...the emulator is RocketLauncher...which it is loading fine. Once it loads RocketLauncher,it puts it in focus,which covers up the emulator that RocketLauncher is loading. It's simply not compatible with RocketLauncher...and probably never will be,as it is there to be an alternative to RocketLauncher...not work side-by-side with it. I already knew that, i was just stating that i get a different outcome to what the OP did. LB having startup and game over screens is good but there is much more than that to RL so ill be sticking with it for the foreseeable future. If Jason ever adds all the RL features to LB then ill gladly drop it. I was responding to OP...you typed a reply the same time I did. I realize there is much more to RL...I have devoted the last 4-5 years of my creativity bug to RL and the media it displays. same goes for me if LB gets like RL then i will ditch RL. Yeah so far this hasn't been compatible with rocketlauncher for me either since it sees rocketlauncher as the emulator, thus making whatever emulator that rocketlauncher launches loses focus and needs to be clicked with mouse to regain focus, and the "game over" screen always launches right after the "loading game" screen if I get to see it at all. Hopefully rocketlauncher get support until it's no longer needed. The startup/shutdown screens are for people who want them but do not want the hassle of using rocketlauncher. If people already have rocketlauncher for fades then you do not need the new startup/stutdown themes as rocketlauncher already does that and you can continue to use them. These are simply for users who DO NOT use rocketlauncher. So yes using both the new startup/shutdown screens AND rocketlauncher fades will break things as these are a replacement and are not to be used in conjunction with rocketlauncher. We already know that as stated above!! But it’s interesting to try these things out and see what happens. It seems that most people would be willing to drop RL if LB gains all the useful functionality from it. Personally id love to see some form of collaboration between Jason and the RL devs, but I think that’s unlikely to happen as they don’t seem to even update RL anymore. The startup/shutdown screens are for people who want them but do not want the hassle of using rocketlauncher. If people already have rocketlauncher for fades then you do not need the new startup/stutdown themes as rocketlauncher already does that and you can continue to use th﻿em. 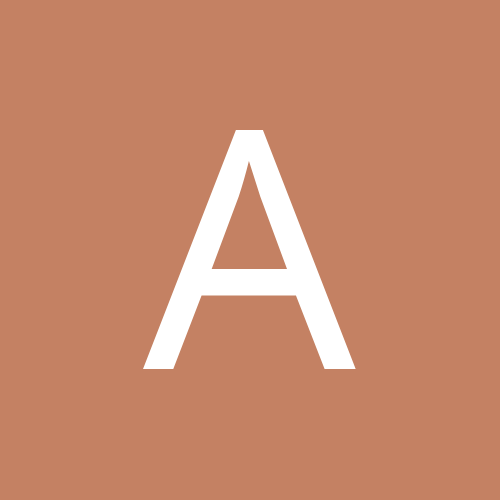 These are simply for users who DO NOT use rocketlauncher. So yes using both the new startup/shutdown screens AND rocketlauncher fades will break things as these are a replacement and are not to be used in conjunction with rocketlauncher. I was trying to use RLauncher to launch the games while using the new loading screens from launchbox, because i personally like them more especially with the themes capabilities. There were just a few emulators which i had trouble using with launchbox which is why i was using RLauncher in the first place, as well as things like mapping my controllers using xpadder for certain emulators/pc games. 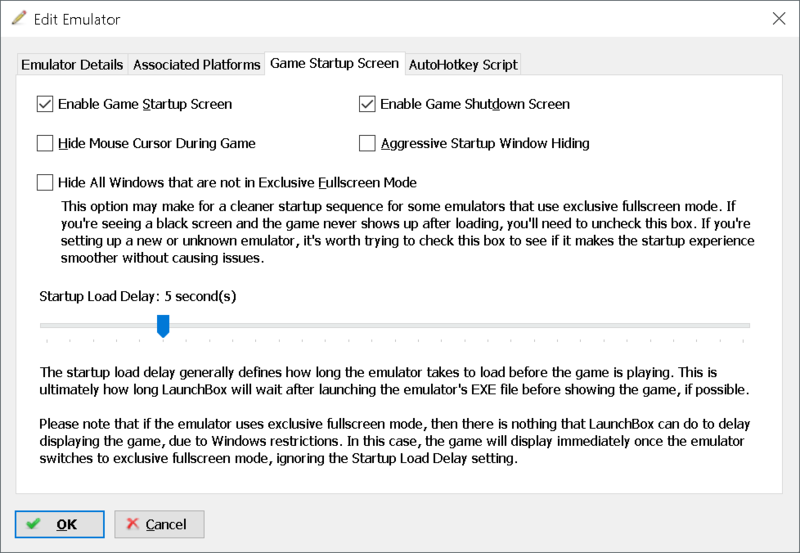 anyway, It would be nice if in launchbox which you select RocketLauncher as an emulator you could just tell launchbox which emulator EXE rocketlauncher would be lunching, this way launchbox would ignore rocketlauncher and just look for the emulator its launching instead for use with the new loading screens. If its to hard or not worth investing the time for the small group of people that use rocketlauncher then that's fine, because i know there's a ton of other features which need to be pumped out. Just would be cool to use the new loading screens with the few systems i need Rocketlauncher for until launchbox makes rocketlauncher obsolete. I use RL for a lot of systems. I turned off the LB start screens in the LB options. Then I run BigBox and it’s still working. Do I need to disable them there as well? Is this only for certain emulators as configured in RL? I turned off fade in RL but it's still my "emulator" in launchbox and for Retroarch, at least, I haven't had a single focus issue. In fact, if I turn on fade in both places, the launchbox fade in appears, and then the final few moments of my RL fade appears (But I have it set to a longer time to play a bunch of still frames), and then the emulator. If I turn off fades in both places, everything still works as intended. In other words, I can't break this if I try. Everything works no matter the combination. I said all this to say maybe another option in the LB startup menu is what's giving people problems? I only turn on the startup and exit screen there. Keep everything else like window hiding etc. unticked.